Enjoy a full-filled afternoon that provides a wide variety of art and delicious tastes from the local chefs and artists in Atlantic Highlands. 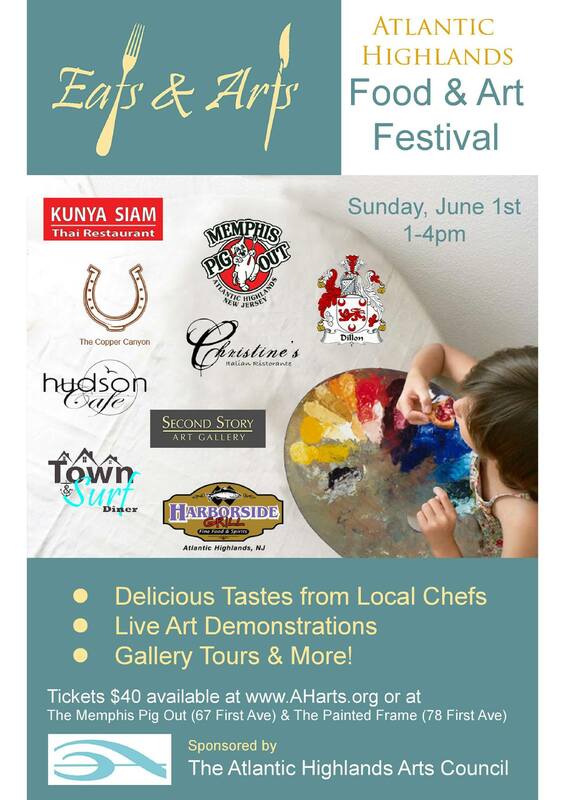 Join other food and art lovers on Sunday, June 1, 2014 from 1-4pm, as several local restaurants and galleries on First Ave will be presenting an afternoon of “Eats & Arts”. Each restaurant will introduce its chef and offer guests tastes of a favorite and popular menu item(s) from its restaurant, while featuring several local artists and live artist demonstrations. The local galleries will also be participating in this “artistic” afternoon by offering food, beverages and a tour of its gallery. The “Eats & Arts” Festival, sponsored by the Atlantic Highlands Arts Council, is intended to create a broad array of art experiences, nurture the development of diverse art forms, and encourage the expanding strength of cultural life in Atlantic Highlands, while providing community interaction. Tickets are $40 and will be available online at aharts.org on April 21; tickets are limited. Participating restaurants and galleries are: AJ Dillon, Christine’s, Copper Canyon, Harborside, Hudson Café, Kunya Siam Thai, Memphis Pig Out, Second Story Art Gallery, Town & Surf Diner and the new restaurant opening on First Avenue.